Visualizing the Ascension of Jesus. 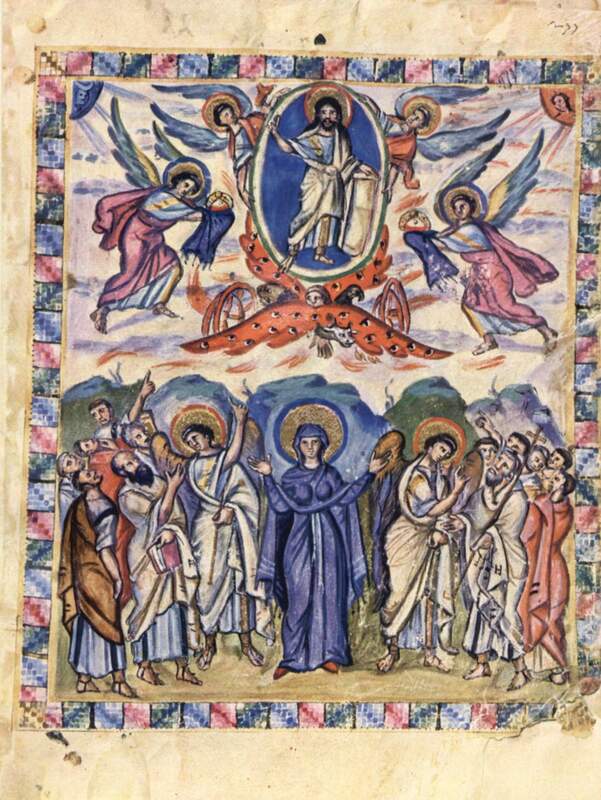 Pictorial depth in, The Ascension of Christ, an illuminated Syriac Gospel Book, is limited. The figures are standing at ground level like relief sculpture and the composition is balanced in bilateral symmetry. The right and left side of the painting balance each other equally and Mary with a halo and blue robe is at the center. Her arms are uplifted in prayer. Byzantine royalty often wore blue robes and by the sixth century, the color blue, representing heavenly grace among other symbolic associations, had been adopted as the color by which Mary, “Queen of Heaven,” would be identified. Uplifted arms while in prayer was a gesture used by early Christians and continues today in some Pentecostal and charismatic churches. Except for the angels and Mary, most of the figures are looking upward at Jesus. In the sixth century, Christ’s ascension was depicted in various ways; one was not to have his body in the picture at all. Only his feet and the hem of his robe would be shown as he entered clouds above. Sometimes only his feet remained in the picture. In another approach, Jesus would move upward by climbing a mountain. In his journey heavenward, Jesus is surrounded usually by a glowing light or is encompassed, as here, by a full body halo known as a mandorla. In the above depiction, two angels are holding the mandorla to assist Jesus in his ascent while two other angels are moving upward bearing crowns. Jesus is standing within the mandorla with his hand raised in a final blessing to those who have gathered below. The biblical account of Ezekiel ascending to heaven on a chariot was familiar to people at this time and, as seen here, a depiction of the ascension in early Christian art often included chariot wheels beneath the mandorla. Previous Previous post: Hail to the Lord’s Anointed, great David’s greater Son!